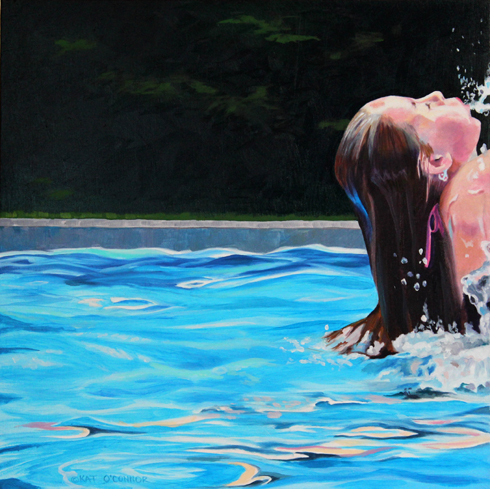 Kat O’Connor’s current paintings deal with the figure in water. They are not portraits, but studies in which solitude is solace. Water and light become buffers, allowing the viewer to stand outside the subject, to watch from the protected darkness, the way we view film. We become voyeurs to these moments, when the subject is surrounded by water, encased in it, needing air and light. Until we have taken that first gulp of air upon surfacing the outside world does not exist. Water becomes a metaphor for painting. O’Connor works in a variety of media, allowing the subject to determine if it will best be conveyed in oil, watercolor, or acrylic. Each medium has its own challenges, and as an artist Kat believes being challenged is essential to creative growth. Kat O’Connor is a Copley Artist of the Copley Society. She earned a BA from Montana State University in 1990 and an MFA from the University of Texas at San Antonio in 1995. Her work has been exhibited nationwide, including three solo shows at regional museums, and won numerous awards. It is included in many private and corporate collections.